A Kickstarter campaign is in progress for a professionlly printed high quality edition, including a box, a 40 pages manual/making-of, a 3.5" floppy disk containing the game + extras. Do not miss your chance to own this new high quality physical edition of the game! Please back the project on Kickstarter. This week, I designed a PCB to build a cartridge for my SNES Sudoku game. Now waiting for the boards... I hope they'll work! As far as I know, two different types of graphics tablets were made available for Wii and for a project I'm working on, I need to be able to communicate with both models. So I acquired them and figured out how they communicate. The process is documented on this page. Part 8: A first relase (v0.1) - Test it! For the March 2019 edition of the RetroChallenge, I'm making a Sudoku game for SNES, with NTT Data Keypad support (a controller/numeric keypad combo). In this post, I talk about my development tools, I set goals and start working on the game. 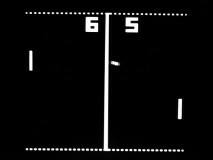 In the previous edition (RC2018/09) I learned a bit of SNES programming, but all I did was a controller test ROM. So for RC2019/03, to avoid forgetting what I managed to learn about 65816 assembly language and SNES architecture, I intend to put my skills to use to make an SNES game, something I've always wanted to do! Back in 2005, I built an interface to control an ISA AdLib card with a parallel port. I recently noticed that my design is compatible with the recent opl2lpt project, so it can also be used with utilities or games with opl2lpt support. A short page where I attempt to list all recent DOS games for which physical editions have been made or attempted. How many games did I miss? A project from 4 years ago I never posted: Circuit and 3D-printable enclosure for an SMS to MarkIII/SMS-J adapter. I decided to port RATillery (written in 8086/8088 assembly) to Android, but without rewriting the game. Hence the project is to create my own 8088 emulator, and I am attempting to do it entirely using Java. Part 11: Being nicer to the CPU (and battery). Where I explain how I stop the game from using 100% of the CPU (or 100% of one core) all the time. Report the controller type as Guitar instead of Classic controller when a guitar is connected. Set unused/meaningless axes to zero when using a guitar. Compatibility fix for the 8BitDo SF30 and other similar controllers. Fix a bug where a Gamecube controller to N64 adapter would be detected as an SNES controller to N64 adapter, but only when a Gamecube controller was connected. Display the correct controller type when a Guitar is connected to a Wiimote accessory to USB adapter. This edition of the RetroChallenge is (already!) over. My overall goal was to learn as much as I could about the NDM24 Modem for Super Famicom, and I think I was successful. I now know enough to write my own code to communicate with it. 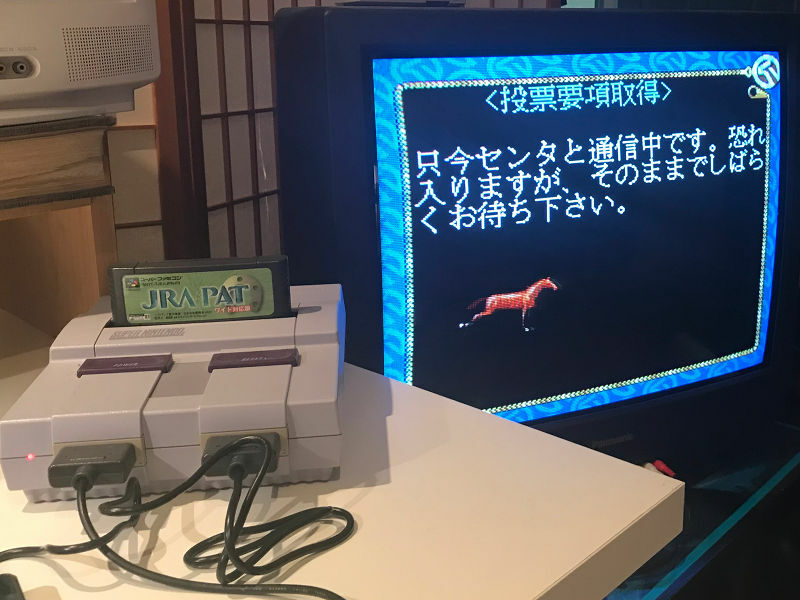 I also know more about what this JRA PAT "game" was and even modified an emulator to let it run as "well" as it does on real hardware: That is to say that in both cases, the game hits the wall of failing to communicate with its server. As I wait for a logic analyser to arrive (to figure out why emulation is not working), I look inside the modem to see what else I can learn and notice a debug port I will probably use. Modem emulation is half working. JRA PAT sends AT commands, but the answers won't get through yet. I will need to probe the signals on the modem to learn more. I implemented basic (functional I think, but not accurate in terms of timings) flash memory emulation. JRA PAT now gets to the point where it want to communicate with the modem. Now I can start trying to emulate it. I taught myself a bit of SNES programming and created a simple ROM: a controller test supporting the NTT Data Keypad. This is the second update, where I seriously start working on emulation, but as I also learn that almost everything I intended to find out is already documented, I set some new goals. This is the first update, where I connect the modem and keypad controller to a Super Nintendo (yes, wrong region) to see what this is all about. I also manage to dial into another computer and try making sense of the first (and only) data frame sent by the game. 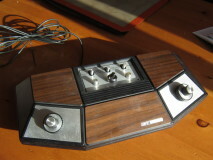 Find out how the modem communicates with the console through a controller port. Learn more about the modem. How fast (or slow) is it? Does it use standard AT commands? Pretend the connection succeeds to see what happens. Attempt to understand the nature of the exchanges between the game and the server. In other words: I am going to spend several hours working on figuring out how an obscure and (now) mostly useless piece of hardware almost nobody has ever heard of nor cares about works. And I know I'll enjoy it! Try the Beta app now! More coming up, stay tuned. Additional sections will be appended to the page in the following weeks. A while ago I bought a pair of unusual Super Famicom controllers that were part of (or for use with) a Super Famicom modem kit. I had a bit of fun figuring out how they work and this page is the result. Things are going quite well so far, so I will most likely have time for the sub quests listed above! Implement a feature to let the adapter manager query the feature set of the current firmware. Read ROM from ROM-Only, MBC1, MBC3 and MBC5 cartridges. Read/Write save RAM for MBC1, MBC3 and MBC5 cartridges. New IO request for even lower latency when using the raphnetraw plugins. A user tested the Transfer Pak and I was able to test a N64 mouse and the Bio Sensor (for Tetris 64). As I expected, everything already just worked and no changes were required. Improved structure and separation for easier maintenance of the code shared between the Project 64 and mupen64plus versions of this plugin. 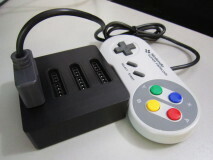 My extenmote project which permits the connection of NES, SNES, Gamecube, N64 and other controllers to Wii remotes (by emulating a classic controller) now also works on the NES Classic Edition. But this needs more testing... Please test and report if you can! In the hope that it will make contributing easier (and therefore less rare), I decided to push many of my projects on GitHub. But I will continue to do official releases on this website, and the option of contacting me by email to discuss anything about a project remains. RATillery is a simple artillery game inspired by gorillas but written to run even on early PCs. In RATillery, two fireball-throwing rats fight atop stacks of crates in a warehouse. Try the game online, or download it for your old PCs! Minimum system requirements: 64kb free memory, 64kb free hard drive (or floppy) space, CGA video card. Adding an Y/Pb/Pr (also known as Component video) to some SNES models is possible, and my triple video buffer board is perfect for this project. Visit the page for an example. A tool to convert 16-bit .EXE et .COM executables to bootable floppy images without DOS. 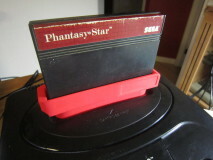 Can recreate the original experience of some old PC booter games or add a nice extra touch to homebrew retro works. Mini-reviews and screenshots of PC games I played as a child. Did we play the same games? They are all excellent games I invite you to (re)discover on your retro PCs or using DosBox! 25 years ago in the course of the 1990-91 school year, as my third grade class visited the computer room for the first time I remember playing Computa games (FR: Jeux de calcul) by André Normandeau. Today, following an interview with the author, I have the pleasure of relating how this educative math game came into existence, and I am delighted to offer an online version. Do you remember playing it? Try it with your kids, it's fun! Besides sending files to your retro PC system, PPUSBCOMM can now receive a disk image, writing it directly to a target floppy disk. Similar to ADT (Apple Disk Transfer) targeting Apple II computers, but for PCs. Ideal to recreate system and PC booter games disks. End of page bonus: Latency explained: What is latency, how it happens, how we can minimize it and a raphnet vs. competition comparative table. PPUSBComm is a tool to copy files from a Linux system with USB ports to a system running DOS with a parallel port. I created this tool to send games and software I download to my Tandy 1000 EX. This USB-specialized circuit board design is inspired from my previous Multiuse Tiny 1 and Multiuse PCB2 projects. This time, since a micro-controller with native USB support is used, it is possible to transfer data at 12 Mbit/s (Full speed) unlike the older designs which, due to the use of a software-only USB implementation (V-USB), were limited to 1.5 Mbit/s (Low speed). 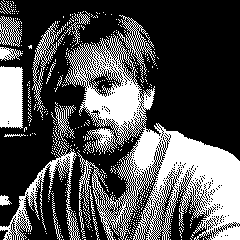 I simply wanted to have fun with an old Tandy 1000 EX computer, but the image quality using the NTSC video output was unbearable. The alternative was to use a CGA monitor of course! But as I don't own one, I started looking at how I could build a CGA to VGA adapter, which I was able to build using an FPGA development kit. The project was the perfect excuse to acquire one. See the page for notes, explanations, schematics and source code (at your own risk). A quick hack I made to improve the compatibility of an SMS to Megadrive cartridge adapter by having an AVR micro-controller drive instructions on the bus before the game runs. The Gamecube keyboard is now supported and can be used normally under Windows and Linux. Note that I only tested ASCII model ASC-1901P0. This keyboard has a dual-connector cable. The gray connector is for the keyboard function and the purple one for the Joystick function. To use both functionalities simultaneously, two adapters are required. As this is a Japanese style keyboard, there are a few unusual keys and many won't produce the labelled characters unless the PC is configured to use a Japanese Keyboard. This week-end I decided to add support for the Dremcast mouse I had received during the week. But for now, it will only be partially supported (no wheel) due to technical limitations. This weekend, I implemented frame reception and USB communication. I now have a working prototype. All that is left is cleaning up the code and drawing a schematic for release. A few pictures to demonstrate how a N64 controller can be converted to USB by installing the circuit within. I began writing the firmware. First step, implement a transmission routine in assembler to achieve a timing identical (or very close) to what is shown on http://mc.pp.se/dc/, but also to what I see on my Dreamcast bus with the scope. Status: Transmission is a success. But looking at the result on a scope is obviously not very useful, so the next step is implementing reception. More fun to come! [Firmwares] Updated V-USB to newer version. Add support for high precision MS5611 pressure sensor. Add support for the MLX90614 infrared temperature sensor. RTD temperature calibration has changed (increased precision). A new release incorporating minor changes to support the Atmega168 MCU.